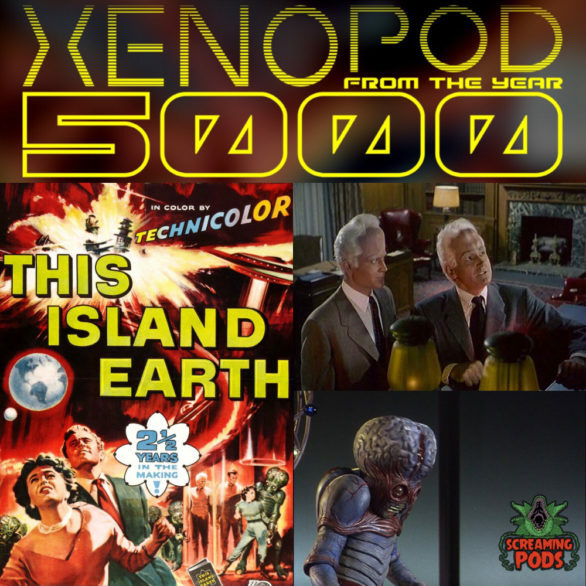 Welcome to the pilot episode of XENOPOD FROM THE YEAR 5000! This is a monthly Science Fiction podcast hosted by Sean Duregger and will feature a rotating door of guest hosts. THIS EPISODE! Brandon Medley joins me to discuss 1955’s THIS ISLAND EARTH. We all are familiar with the Metaluna Mutant, and maybe we all saw it via MSTK3000: THE MOVIE. But Sean and Brandon discuss the film on it’s own merits. The song “Quark” by Khovatic was used in the show intro. Please check out Khovatic at khovatic.bandcamp.com. Please make sure you follow the show on Twitter @XENOPOD5000 & subscribe & rate over at iTunes! Looking forward to more of these, hopefully you’d be able to do more than one a month. I’ve only seen the MST3K version of “This Island Earth”, but it’s still good (they laugh with the movie and not really at it, if that makes sense). You were unclear on one of the details… they needed the tubes to get the humans adjusted to the Metalunan atmosphere, which is why they needed to use them to get back to Earth because they couldn’t breathe Earth’s air anymore. Surprised that you didn’t recognize one of the actors… Doctor Steve Carlson was Russell Johnson, aka. The Professor from “Gilligan’s Island”. The “magnetic clamps” were used when the humans were locked in the tubes. Thanks for listening! I’m working on taking better notes on these films, I’m rusty but I’ll get there. Next up is Repo Man & Repo Chick with Mike Delaney! Should be fun!